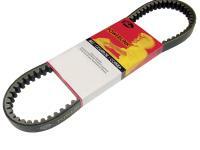 Gates Powerlink Standard CVT Drive belt size 781-18.5-28. Fits Aprilia Scarabeo 50 DiTech (49cc) 2001-2006. Standard belt fits the following models: Aprilia Mojito, Aprilia Scarabeo 50 Ditech, SR50 Ditech Factory (Morini engine), and 2000-2006 Scarabeo 50 Ditech.